Deep brain stimulation (or DBS) is a variation of an old surgery that may be used to treat tremors in people with conditions such as multiple sclerosis (MS), Parkinson's disease, and essential tremor. In the 1960s, surgery was used to destroy a small area deep in the brain called the thalamus (thalamotomy) or another part of the brain called the globus pallidus (pallidotomy). These surgeries are still done today, although less frequently because of the availability of deep brain stimulation. These surgeries carry significant risks: both thalamotomy and pallidotomy require purposeful destruction of areas of the brain. If the surgeon is off by even a fraction of an inch, the surgery may not be effective and severe complications such as paralysis, loss of vision, or loss of speech can result. Deep brain stimulation is a way to inactivate parts of the brain without purposefully destroying the brain. Therefore, the risks are much lower. 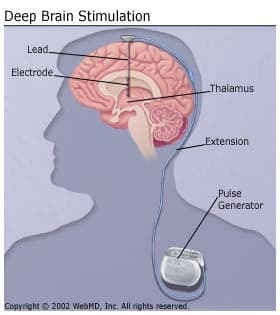 In deep brain stimulation, the tip of an electrode is placed in the thalamus (for tremor and multiple sclerosis) or in the globus pallidus or subthalamic nucleus (for Parkinson's disease). The electrode for deep brain stimulation is left in the brain. It is connected by a wire to a pacemaker-like device that is implanted under the skin over the chest. The device generates electrical shocks. Deep brain stimulation offers many advantages. The electrical stimulation is adjustable, whereas surgical destruction is not. The electrode has four metal contacts that can be used in many different combinations. Even if one electrode contact is not in the exact location, it is likely that one of the others or some combination of the electrical contacts will be closer to the proper target. As the patient's response to surgery changes over time, the stimulation can be adjusted without requiring a repeat operation. Another significant advantage of deep brain stimulation relates to future treatments. Destructive surgery, such as thalamotomy or pallidotomy, may reduce the patient's potential to benefit from future therapies. With deep brain stimulation, the stimulator could be turned off if other therapies were to be tried. The main purpose of deep brain stimulation for people with multiple sclerosis is to control a severe tremor related to the disease. In the case of multiple sclerosis, other problems such as loss of vision, sensation, or strength are not helped by deep brain stimulation. No. Electrical stimulation does not cure multiple sclerosis nor prevent the disease from getting worse. It helps to relieve the symptom of tremor related to MS. Deep brain stimulation is not experimental. The FDA has approved DBS to treat Parkinson's disease, essential tremor, and dystonia. Dystonia is a type of movement disorder characterized by abnormal postures and twisting motions. The FDA has not specifically approved deep brain stimulation of the thalamus to treat multiple sclerosis. However, this does not mean that the treatment is experimental or that it would not be covered by insurance. There are many examples of treatments that are used every day but have not been approved by the FDA for a specific medical condition. Before considering surgery, you should try medication first. If drugs are able to control your symptoms, you should not get DBS. But you and your doctor should consider the surgery if you do not have good control through medications. If you are unsure if DBS is right for you, talk to a movement disorders expert or a neurologist who has experience with movement disorders. Deep brain stimulation should be performed in a center where there is a team of experts to care for you. This means neurologists and neurosurgeons who have extensive experience and specialized training in doing these types of surgeries. Always ask a doctor how many of a specific procedure he or she has performed. The Johns Hopkins Parkinson's Disease and Movement Disorders Center.